Unfortunately, vehicles are one of those things that have never made an official appearance in the Fallout universe. This is primarily due to a few factors, with the primary one being that the game engine just isn’t stable enough to use vehicles. Also the terrain in the Fallout games, is obviously very crooked with broken roads and blocked paths, who wants to walk around a clean wasteland? Whilst Bethesda don’t plan on implementing their own vehicle system, that doesn’t mean the modders wont! Fallout 3 and Fallout New Vegas both got there own share of vehicle mods, and now Fallout 4 is getting some too thanks to the modding community! In this post, where going to talk about the “Driveable Motorcycle Mod” by Hunk92 on Nexusmods. It adds a motorcycle to the game, which you can customise by adding different paint jobs and equipment. 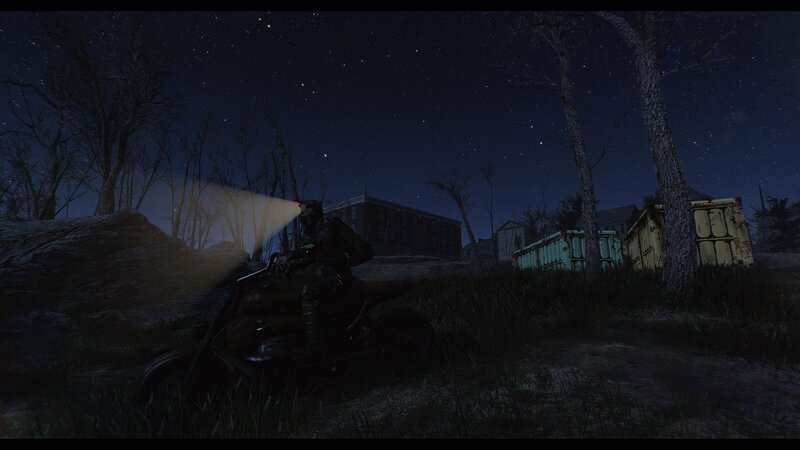 My Fallout character going for a night ride! Head over to the mod page here. Ensure that you are signed in, if not create a new account (it’s free!). As of right now, I’m unsure on whether installing via the Nexus Mod manager is supported. Instead, we’re going to do it manually. Click the green “Download (Manual) button at the top. On the next page, under “Driveable Motorcycle”, select “download manually”, a ZIP file will begin downloading. Inside it are 5 files, select everything apart from the “README”. Drop the selected files inside the “Data” folder in your main Fallout 4 directory. You may already have that line inserted, so double check. The mod is now installed and you can run the game. Note: You may have to go into Nexus Mod Manager and go into the plugins tab. Here, you should tick “Driveable motorcycle”. 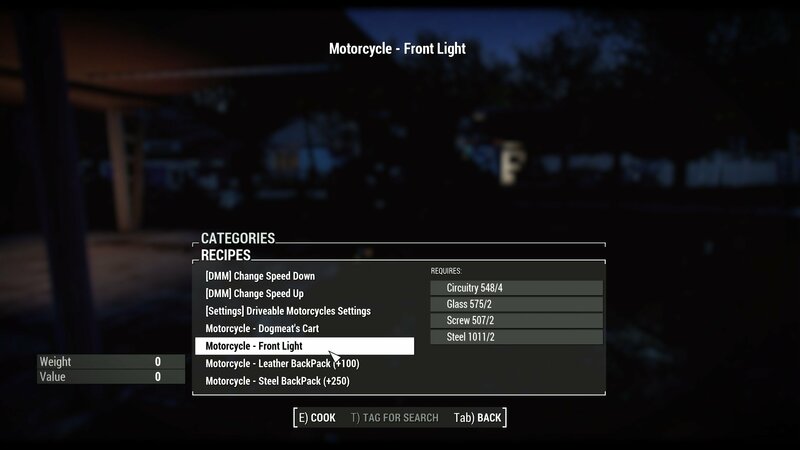 When you have installed the mod, you can find the motorcycle behind the Museum of Freedom. You should note that it isn’t directly behind it, there is a small area with some big containers and rusted cars, that is where you will find it. This is what the bike looks like when you first find it. 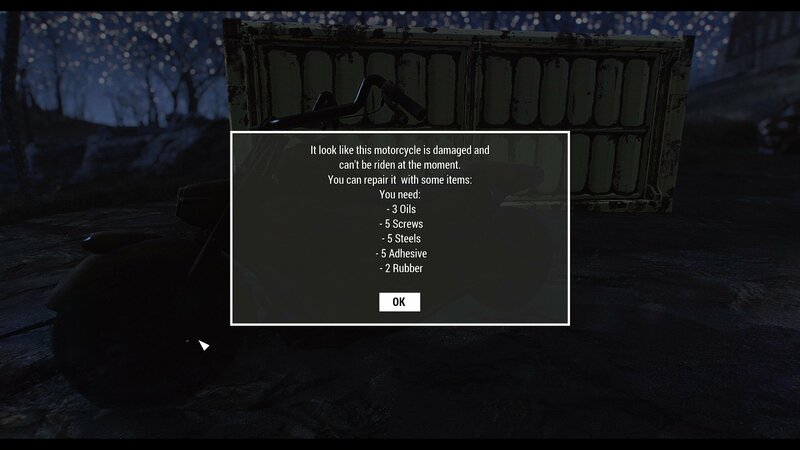 Once repaired, you can mount your bike and ride it! It’s much better to go first person. Use W to accelerate and use your mouse to steer, pretty simple. Your best bet would be to drive it to your nearest Chemistry station to do some mighty fine upgrades. At the chemistry station, you can craft paints for the main body and the wheels. 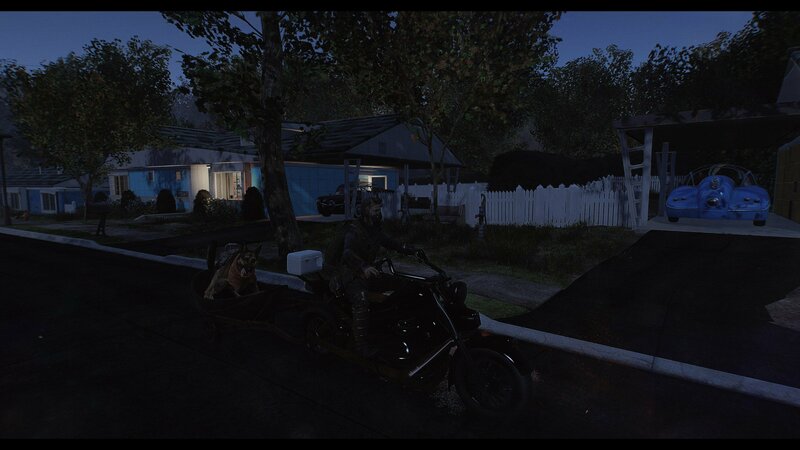 You can also create various equipment such as front lights, storage box and even a cart for dog meat to ride in! When you craft these items, they’ll end up in your wearable items slot. Just transfer them over to the motorcycle and equip them to make the changes. 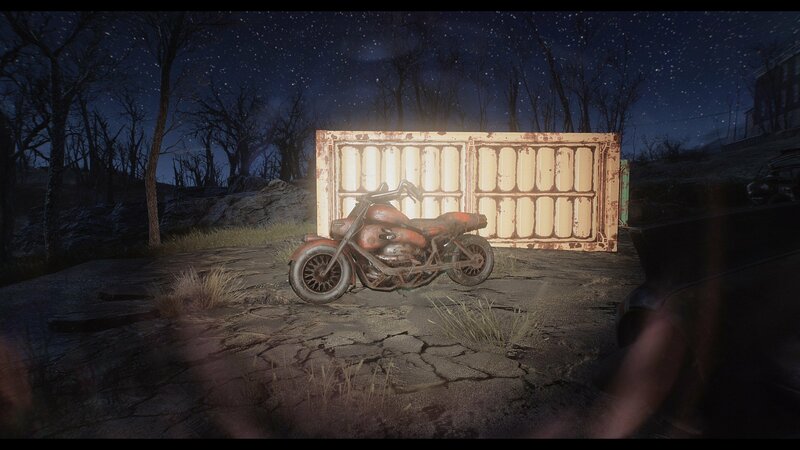 Some of the motorcycle upgrades I made, including a very happy dogmeat!